Worcester is a small rural community nestled in the natural protected splendor of the valley of the North Branch of the Winooski River, flanked by the Worcester Mountain Range and Calais hills. Our village is anchored by a large greenspace protected from development. This vital common ground serves a variety of recreation activities and celebrations. The village center is alive with a practical collection of businesses and services for Worcester residents, well-preserved historical buildings still in regular use, and citizen gathering venues. Small-scale industry, suitable in size and character to its rural environment, thrives in Worcester and provides a living for those who choose to work there. Total area: 38.8 sq. mi. 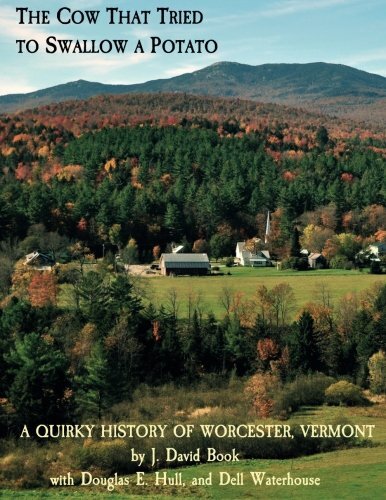 The Cow That Tried to Swallow a Potato – that’s the history of Worcester, Vermont. Life happened, and often it was quirky and interesting. No big battles, no national movements, no spectacular events – just the everyday lives of hard-working Vermonters trying to get by, and from time to time, producing some noteworthy and unconventional history. In chronicling those stories and recording the successes and failures of those who went before us, this book is unlike any local history you have ever read. Copies available for purchase at the Town Office for $20.00 (large copy) $10.00 (smaller copy) Processed go to the Worcester Historical Society.